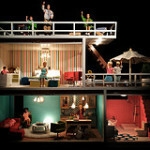 89/365 – “Dolls’ House” nr.30, a photo by Luca Rossini on Flickr. 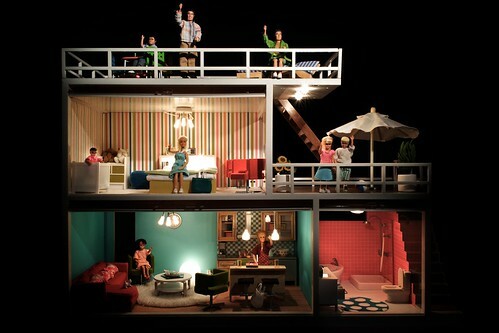 Dolls’ House theme is over, thanks for following it through. It has been a weird, deep, emotional, and fun voyage for me. For the first time I could work at “telling stories” in a completely different manner, as I was the director of photography of a series of movies, and each daily shot was the central point of each story. The ability to take control over illumination, perspective, framing, staging, and character position and interaction let me free to wildly look into my imagination to see what I wanted to talk about. Now I can tell you I chose this particular house (which I wanted to show you as whole in this last image of the project) because to me it helps symbolizing the moment in space and time in which North America realized the American Dream, which would then become the Western Dream, was actually already over. Nowadays it seems that the European Dream is over too, and these scenarios helped me talk about it. These perfect, middle-class families are fading into the fear of a very uncertain future, with fewer jobs than inhabitants, temporary contracts, expensive loans, and very little political control over the whole situation. See you tomorrow to start a new theme together!